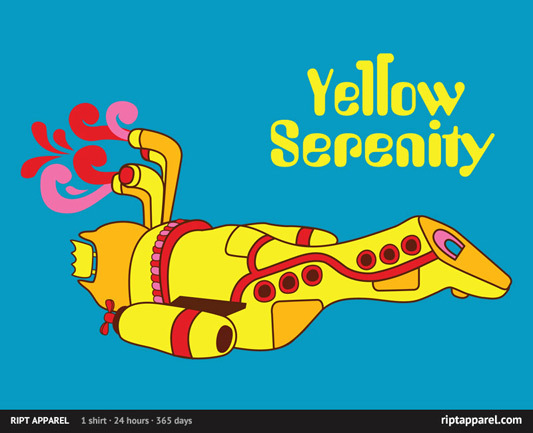 The $10 t-shirt deal of the day over at RIPT Apparel is a Firefly-themed shirt with the design used for The Beatles Yellow Submarine called “Yellow Serenity” by Kent Zonestar. The sale at RIPT began today, Sunday, May 27, 2012, at midnight CST, and will continue for 24 hours from then, and once it’s over, it will not be sold on the site anymore. The t-shirt is available in men’s and women’s sizes for $10 each in turquoise. Kids sizes are $15 (Boys, Girls, and Toddlers in blue colors); Onesies are $18 (in powder blue). You can also get the design on a Hoodie for $38 (in Men/Unisex sizes in teal). This shirt is the ship from Firefly reimagined in the trippy art style of the Yellow Submarine.